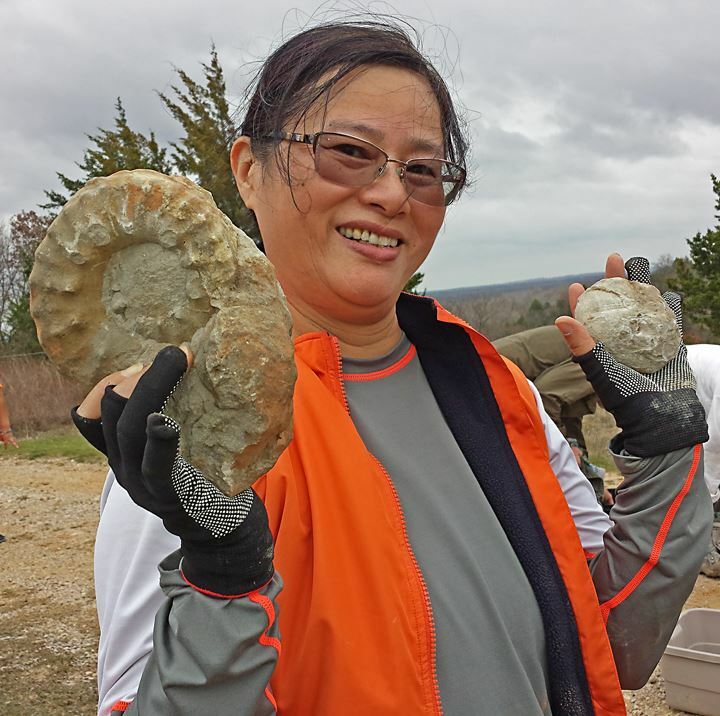 Thirty-five hardy members accumulated on Saturday, 12/12 for some collecting at a Duck Creek Formation site up on the Red River west of Lake Texoma the DPS hadn’t collected in many years. Rain was threatening, but didn’t happen until later that afternoon. Access to the river from the land owner’s property was via a path that had been cut down to the river from his bluff top years ago. This put everyone at the base of the first (southernmost) bluff of the three that are exposed on this bend of the river. Beyond the usual permission to access his property, though, he also hauled members across his property in his Kubota 4-wheeler to where they could access the second bluff more easily than traversing the first bluff. This way was even steeper than the first so even more exercise was gained by those folks. As can be seen in the photos, the river was much too high to allow collecting in the primary ammonite zone that us at the water level. The problem is that the Gainesville USGS gauging station was reading over 8’ which we were told would be acceptable, but didn’t turn out to be true. A return trip has been promised when the hydrograph reads 5’ or less. Nonetheless, quite a number of ammonites were found, mostly Mortoniceras equidistans instead of the more common Eophydiscus marcianus. Also, surprisingly, very few Holaster simplex echinoids were found, but many Macraster and a few Heteraster genera were given good homes. We finished up about 1PM and headed to the famous McGehee’s Catfish Restaurant that overlooks the Red River. Following a great lunch we followed Mark McKinzie for some collecting at Moss Lake in the Goodland Formation where Linda Farish seems to have had the most notable find – a Loriolia echinoid, was the best id given.